You’ll get extra 20 points for a bet placed by you on the Reel Roulette on a winning symbol. 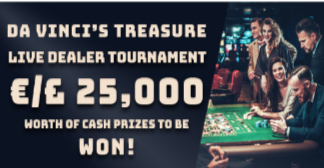 You can earn even more with the mystery treasure cards that will be added into the shoe of Blackjack 1 and VIP 1 tables. Do your best to be the first on the leaderboard because the first place is awarded £5000. The second one takes £3000, while the third position on the leaderboard will obtain £2000. This bonus cash comes with no wagering requirements. The promotion will run from the 20th to the 30th of September. This is the moment you've been waiting for - are you up for the challenge?